To help in your search for Costa Blanca villas, the maps below show the area uncluding the main resorts, towns and villages. The inset map shows how this relates to Spain as a whole. Search the Costa Blanca area now for villas to rent. Which area for your holiday villa? 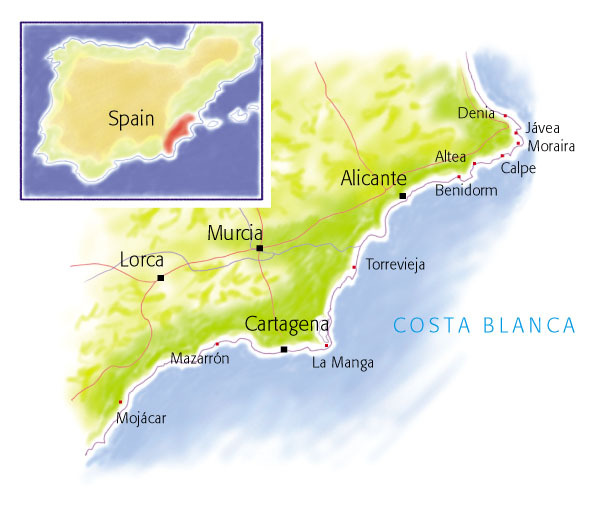 Use the Costa Blanca map below, together with our villa search, to help you decide which part of the area you prefer. We list holiday villas for rent from Denia in the north to Mojácar in the south, including the ever popular resorts of Benidorm and Alicante. For the best areas for private villas rentals in the Costa Blanca we reccommend looking from Aleta northwards and the area around Torrevieja. If you have reached this page without reading our introduction to villas in the Costa Blanca then you may like to follow the link to read a little more about the area as a villa holiday destination.